â€œIf my career seems strange to you, it seems stranger and more incredible to me,â€ Gen. Homer Lea once said. And indeed it was, for Leaâ€™s life was the tale of a badly handicapped boyâ€™s adventures as a leader in an exotic foreign land. 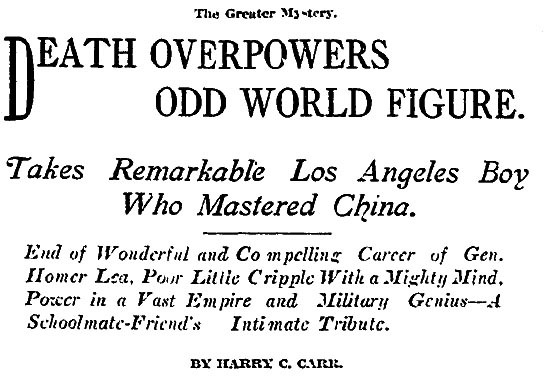 His 1912 obituary in The Times begins: â€œHis great work finished, the pitiful, wasted little body of the American boy who overthrew the tattered old Chinese empire lies silent in his home in Ocean Park. Gen. Homer Lea died yesterday. A Jan. 28, 1907, article in The Times notes that despite the physical strain of taking part in the recent city elections, Lea has written several articles on the Chinese Exclusion Act for various magazines and adds that his first novel, â€œThe Vermillion Pencil,â€ a critical work about Christian missionaries in China, is about to be published. Who was Homer Lea? Itâ€™s a little difficult to tell. â€œSo much rot and twaddle has been written about him that I want to set down the simple facts as I know them and as he told them to me,â€ Carr said in Leaâ€™s obituary. Leaâ€™s disabilities kept him from taking part in athletics, but he had a keen mind, Carr says, and took part in the debating societies at Los Angeles High School. Upon graduating in the Class of 1897, Lea went to Stanford with the intention of becoming a lawyer. First, Carr says, he remembered reading about turmoil among the rulers of the Chinese empire. The next thing he knew, Lea was a prominent guest at Chinese banquets in San Francisco. â€œThen he slipped away and went to China,â€ Carr says. â€œAbout this time, one of the most remarkable events ever seen on the Pacific Coast took place in Los Angeles Chinatown. Nearly all the young Chinamen cut off their cherished queues and formed themselves into an infantry company. It was drilled every night behind an enclosure in the Chinese quarter,â€ Carr says. Lea and Kang soon left for a trip around the world, meeting with President Teddy Roosevelt, and then went to Europe. Lea returned to Los Angeles and began writing â€œThe Valor of Ignorance,â€ intending to â€œshow that war with Japan is certain to happen some day and that the United States is utterly unprepared for such a conflict,â€ Carr says. 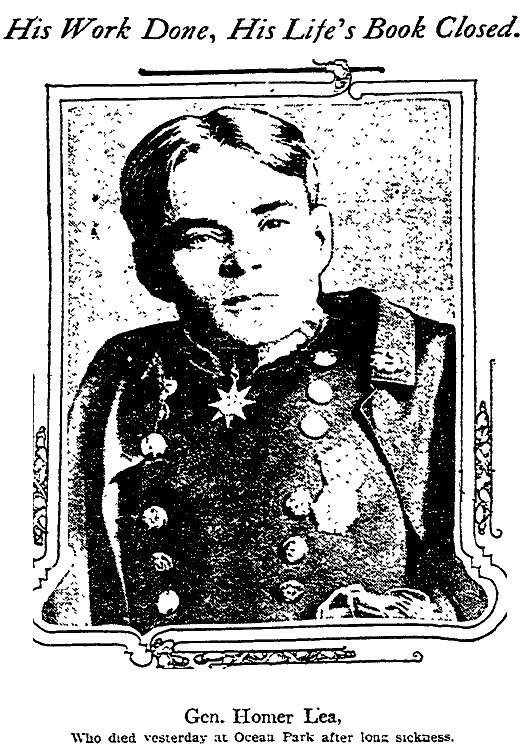 Carr reminisces about a breakfast he had at the Lankershim Hotel with Lea a year before the military leaderâ€™s death. Their third companion turned out to be Sun Yat Sen.
Lea left for China shortly after that, only to return with a fatal illness. And as you can tell from the photo, he wasn’t Chinese.